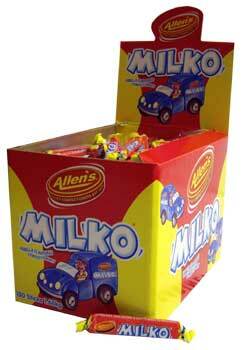 These have been around for generations - your grandparents could probably tell you a story or two about a Milko chew! These vanilla flavoured soft chews have a distinct milky taste that has stood the tests of time. Each is individually wrapped. Corn Glucose Syrup, Sugar, Palm Oil, Food Acids (E296), Gelatine, Flavour, Emulsifier (E491, E473), Antioxidants (E300), Colour (E163), Salt. These are one of my favourite things ever, taste fabulous - the only problem is that they disappear so fast! These things are amazing they taste great and are worth the little money you pay! Highly recommended.